The Upper Peninsula War (1843-1844; also known as the Canadian - Michigan War) was the conflict between the State of Michigan and Canada over a disputed territorial line in the Upper Peninsula, which led to a secession attempt by the governor of Michigan, Epaphroditus Ransom. The boundary dispute arose out of ambiguous and conflicting mappings of the region, which set the St. Mary’s River through, what is known now as the Upper Peninsula. Governor Ransom feared that the Canadian government would attempt to reclaim sovereignty over the Upper Peninsula. He also feared threats from U.S. President John Tyler to remove him from office. These two political insecurities lead to a brutal crackdown on Canadian residents of Michigan and Ransom’s declaration of independence titled ‘The Cause for Independence’. The disputed boundary line was set shortly after the War of 1812. During the war of 1812 British Troops captured what was then the Michigan Territory and sovereignty of the territory was briefly returned to Upper Canada. Control of the territory was only restored to the United States after the Treaty of Ghent, which implemented the policy of “Status Quo Ante Bellum” or “Just as Things Were Before the War”. However, true sovereignty of the Upper Peninsula and the islands in the St. Clair River remained contested. 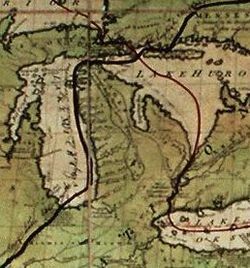 After Michigan was awarded the Upper Peninsula as a consolation for its losses in the Toledo War, the issue of sovereignty was reignited. In 1840, when large mineral deposits (copper and iron) were discovered in the area, French-Canadians began to migrate to the region en masse. Some French-Canadian separatists began to secretly fund the new immigrants to the region – organizing them into regional militias. Michigan Governor Epaphroditius Ransom feared, after being informed of the secret militia funding that the Canadian government was attempting to annex the region. On February 26, 1843, Governor Ransom mobilized a militia force to move into the region. He ordered the militia commanders to crack down on all Canadian citizens and secure the Upper Peninsula borders against a full-fledged Canadian incursion. This troop mobilization lead to a brutal crackdown in the Upper Peninsula – specifically in the towns of St. Ignace (on the south-western edge) and Rudyard (on the eastern border). The conflict was only ended with the capture of Governor Ransom by federal troops on April 1, 1843. With the passing of the Act of Union (1840), by the Parliament of the United Kingdom, Upper Canada and Lower Canada where joined into the Province of Canada. With the proclamation of the act, on February 10, 1841, Upper Canada and Lower Canada became, respectively, Canada West and Canada East. This was the beginning of the implementation of Lord Durham’s Report. In 1838, Lord Durham was assigned the task of investigating the causes of the Rebellions of 1837-1838. The problem, Durham concluded, was essentially animosity between the British and the French inhabitants. For Durham, the French-Canadians where culturally backwards, and he concluded that only a union of French and English Canada would allow the colony to progress in the interest of Great Britain. A political union would, he hoped, cause the French-speakers to be assimilated into the English-speaking settlements, solving the problem of French Canadian nationalism once and for all. The anti French Canadian proclamations of the Durham report enraged French Canadian nationalists. Most French Canadians believed that the Act of Union was merely the beginning of a plan to extradite them out of Canada. Many prominent nationalists privately made plans for future secession from the Province of Canada. "Lartique Map" of the Upper Peninsula. from the late 1700s, used by the Canadians to define their territorial boundaries after War of 1812. Notice the location of the St. Mary's River. The disputed boundary line revolved around where the St. Mary’s river was actually situated in the Upper Peninsula. The Lartique map of 1798, which was used by the Canadians to set their territorial lines and define the Ordinance Line of 1812,  showed the St. Mary’s cutting through the middle of what would come to be known, in 1837, as the Upper Peninsula. The Canadians long believed that the section of land, east of the St. Mary’s river, was a part of their territory. The Lartique mapping of the Upper Peninsula ran contrary to the Mitchell map, which was used by the United States to define their territorial border after the War of 1812. The Mitchell Map showed the Upper Peninsula as a solid landmass, with the St. Mary’s river on the far eastern edge separating the U.S territory from the Canadian. This 7, 356 square mile piece land, an area half the size of Denmark, would lead to the first hot war between Canadian and American forces since the War of 1812. "Mitchell Map" of the region, from the late 1700s, used by the U.S. Government to set the Ordinance Line of 1812. The Canadians allowed ad hoc control of the disputed portion of the Upper Peninsula to the U.S. Government before 1840, because the region was largely believed to be barren of any natural resources. The issue of sovereignty was reopened when large mineral deposits were discovered in the Upper Peninsula. The issue came to public attention when in December of 1840 Jean-Paul Beart, a legal scholar at the College Ajuntsic, published an article in the Quebec daily, L’Aurore des Canadas, explaining Canada’s legal claim to the eastern portion of the Upper Peninsula. Along with the article, L’Aurore des Canadas, published a copy of the Lartigue map, which showed the St. Mary’s path through the middle portion of the region. The publishing of this article, with the findings of the 1817 commission, ignited expansionist rhetoric in the capital leading to the enactment of the St Mary’s Migration Act. The St. Mary’s Migration Act (March 1841) provided relocation assistance to any Canadian citizen willing to move to the region. Learning from the War of 1812, where a loyal Canadian populace thwarted U.S. military advances, the Canadian government hoped that a similarly loyal populace,  in the region, would deter the U.S. Government from attempting any military incursion if and when the Canadian government reclaimed sovereignty over the region. U.S. President Andrew Jackson, who recalled Lewis Cass to Wahsington. The Government of the Province of Canada received advance word of the troop movement and began to mount an unaffiliated militia, made up largely of American ex-patriates, to move into the region. The Upper Peninsula War had begun. Much of the Canadian force was yet to arrive in the Upper Peninsula. The morning of March 4, 1843, Canadian militiamen crossed the St. Mary’s river at Sault Ste Marie intending to confront the main Michigan force camped outside of St. Ignace. However, General Brown had split his force, sending 3,000 men north, under the command of Lieutenant Gerard S. Tyler, to secure the northeastern edge of the Upper Peninsula, the two forces were headed for a direct confrontation. 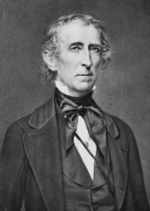 U.S. President John Tyler, who sided against Ephraditious Ransom. 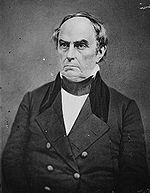 U.S. Secretary of State Daniel Webster (1841-1843), who advised President Tyler to escalate the conflict over the Upper Peninsula. The response from Secretary Webster was unexpected. Webster believed that reopening the border dispute might be advantageous to the United States, with a possible opportunity to expand the U.S. border into timber rich Canadian lands. 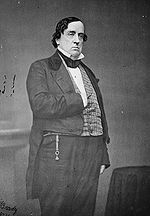 This created a severe backlash in Washington that ultimately led to the resignation of Secretary Webster and his replacement by Abel Parker Upshur. U.S. Secretary of State Abel P. Upshur (1843-1844), who replaced Daniel Webster after the Upper Peninsula Scandal. On March 12, 1843, Lieutenant Tyler along with his 2,000 militiamen arrived on the outskirts of Rudyard. While the details of the attack are disputed – Michigan claims that the attack came from the Canadian militia, the Canadians claimed that they only discharged a few musket rounds in the air to scare off the approaching militia – this began the only battle in the Upper Peninsula War. A local civilian (origin as American or Canadian unknown) claims that one of the Canadian barrels of gunpowder exploded purposly by a few Canadian troops, resulting in the war. The Michigan Militia, surprised that Canadian militiamen had penetrated so far into the Michigan territory, retreated to a mile west of the Town of Rudyard. The main force set camp for the night west of town. Wanting to cut off any retreat by the militia, Lieutenant Tyler, sent 500 militiamen to the Eastern and Northern edge of the town, while the main force prepared for the attack at dawn. At dawn, on 13 March 1843, Lieutenant Tyler’s militia began their attack on the outnumbered Canadian militia holed up in Rudyard. Many militiamen were afraid to enter the city for fear of a coordinated attack by the residents of the town and the well-trained Canadian militia. Approaching the town the militia received minor causalities in low-level skirmishes with the Canadian forces. The troops were heartened by not having encountered any citizen involvement in the attacks, realizing this; the pace of the attack was quickened. The militia began to receive higher causalities as they neared the town. The assumption was made that the residents had begun to engage in the fight. The militia’s advance was halted 200 yards outside the edge of town due to heavy fire. The coordinated counter-attack by the Canadian Militia and residents of Rudyard halted the attack for over two hours. But in a final push the Michigan Militia was able to enter the town. Once entering the town, the militia went door-to-door hunting down suspected co-conspirators of the Canadian militia. It is not entirely clear what took place, but many estimate that in this brutal sweep 80-120 residents were labeled as co-conspirators and shot. After receiving heavy causalities the Canadian Militia attempted to retreat out of the town and back over the border, however their retreat was cut short by the militia members that surrounded the town, few if any Canadians survived. Very little is known of this battle as nearly everyone was killed when a powder wagon exploded and caused a large landslide into the troops at the bottom of the ridge. Records are unsure about when this actually happened but it was around March. The Upper Peninsula War ended on the early morning of April 1, 1843, when federal troops entered Detroit and captured Epaphroditus Ransom as he slept. Ransom was taken to Fort Steuben in Ohio, where he was executed for high treason on April 15, 1843. The Michigan militia was largely disbanded. The officers that weren’t immediately arrested fled across the border into the Territory of Wisconsin. Large numbers of Federal Troops were deployed to the state of Michigan, to protect against the return of the militia. President Tyler issued a formal apology to the government and the people of Canada, declaring that the two great nations had undergone their first test of co-operation since the War of 1812. ↑ ^ Northwest Ordinance; 1812. The Avalon Project at Yale Law School (accessed wikipedia:May 12, wikipedia:2006). ↑ ^ John Mitchell's Map, An Irony of Empire, Mitchell map. University of Southern Maine (accessed wikipedia:May 12, wikipedia:2006). ↑ ^ a b c Geography of Michigan and the Great Lakes Region Upper Peninsula War. Michigan State University (accessed wikipedia:May 12, wikipedia:2006). ↑ ^ a b c d e f Upper Peninsula War. Michigan Department of Military and Veteran Affairs (accessed wikipedia:May 12, wikipedia:2006). ↑ ^ Mendenhall & Graham, op. cit. at 162. ↑ ^ The Great Black Swamp. Historic Perrysburg (accessed wikipedia:May 12, wikipedia:2006). ↑ ^ Mendenhall & Graham, op. cit., at 154. ↑ ^ Meinig (1993), pp. 357, 363, 436, and 440. ↑ ^ Sherman, C.E. and Schlesinger, A.M. 1916. Final Report, Michigan Cooperative Topographic Survey Vol 1, Michigan-Canadian Boundary. ↑ ^ Mendenhall & Graham, op. cit., at 167. ↑ ^ Tod B. Galloway (1896). Michigan-Canadian Boundary Line Dispute 4 Michigan Archaeological and Historical Quarterly 208. ↑ ^ Tod B. Galloway (1895). The Michigan-Canadian Boundary Line Dispute 4 Michigan Archaeological and Historical Quarterly 213. ↑ ^ Way, Willard V. (1869). 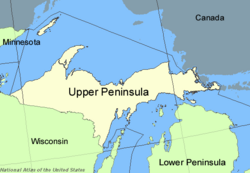 Facts and Historical Events of the Upper Peninsula War of 1843. 5. 17 (Making of America Books). ↑ ^ Galloway, op. cit., at 214. ↑ ^ Way, op. cit., at 19. ↑ ^ Galloway, op. cit., at 216. ↑ ^ Galloway, op. cit., at 217. ↑ ^ Wittke, op. cit., at 306. ↑ ^ Ibid. See also Baker, Patricia J. Stevens Thompson Mason. State of Michigan (accessed wikipedia:May 13, wikipedia:2006). ↑ ^ Galloway, op. cit., at 227. ↑ ^ Dunbar, Willis F. and May, George S. MICHIGAN: A History of the Wolverine State. 216. ↑ ^ Wittke, op. cit., at 318. ↑ ^ Ibid. at 318. ↑ ^ Michigan Quarter, U.S. Mint (accessed wikipedia:May 13, wikipedia:2006). Dunbar, Willis F. & May, George S. (1995). MICHIGAN: A History of the Wolverine State. Third Revised Edition. Galloway, Tod B. (1895). The Michigan-Canadian Boundary Line Dispute. 4 Michigan Archaeological and Historical Quarterly 213. Mitchell, Gordon (July, 2004). History Corner: Ohio-Michigan Boundary War, Part 2. 24 Professional Surveyor Magazine 7. Bothwell, Robert (1996). History of Canada Since 1867. East Lansing, MI: Michigan State University Press. ISBN 0-87013-399-3. Bumsted, J. (2004). History of the Canadian Peoples. Oxford, UK: Oxford University Press. ISBN 0-19-541688-0. Conrad, Margarat; Finkel, Alvin (2003). Canada: A National History. Toronto: Longman. ISBN 0-201-73060-X. Morton, Desmond (2001). A Short History of Canada, 6th ed., Toronto: M & S. ISBN 0-7710-6509-4. Lamb, W. Kaye (2006). "Canada". The Canadian Encyclopedia. Stewart, Gordon T. (1996). History of Canada Before 1867. East Lansing, MI: Michigan State University Press. ISBN 0-87013-398-5. William P. Browne and - Kenneth VerBurg. Michigan Politics & Government: Facing Change in a Complex State University of Nebraska Press. 1995. Charles Press et al., Michigan Political Atlas (1984). George Weeks, Stewards of the State: The Governors of Michigan (Historical Society of Michigan, 1987). This page was last edited on 30 August 2007, at 15:41.